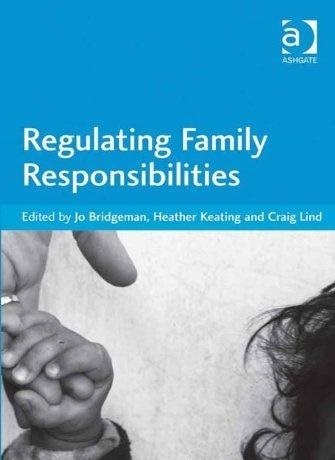 This collection brings together some of the most eminent and exciting authors researching family responsibilities to examine understandings of the day to day responsibilities which people undertake within families and the role of the law in the construction of those understandings. The authors explore a range of questions fundamental to our understanding of 'responsibility' in family life: To whom, and to what ends, are family members responsible? Is responsibility primarily a matter of care? Can we fulfil our family responsibilities by paying those to whom we owe responsibility? Or by paying others to fulfill our caring obligations for us? In each of these circumstances the chapters in this collection explore what it means to have family responsibilities, what constitutes an adequate performance of such responsibilities and the point at which the state intervenes. At the heart of this collection is an interest in the way in which the changing family affects people's perception and exercise their family responsibilities, and how the law attempts to regulate (and understand) those responsibilities. The essays range across intact and separated or fragmented families, from lone and shared parenting in single homes to caring across households (and even across international boundaries) to reflect on the actual caring responsibilities of family members and on the fulfilment of financial responsibilities in families. This collection seeks to advance our understanding of the attempts of the law, and its limits, in regulating the responsibilities which family members take for each other.